Realme announced the arrival of the new software updates on its website. 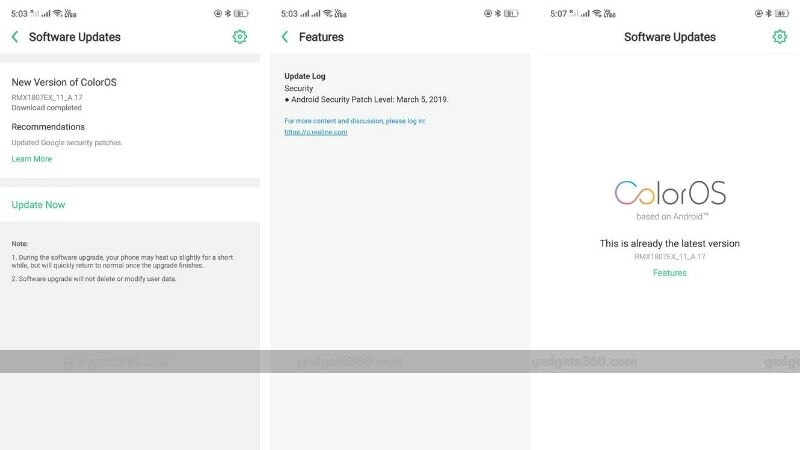 According to the company, the Realme 2 Pro update carries the software build number RMX1801EX_11.A.17_0170_201903151409 and just includes the March Android security patch for the smartphone. The company also hinted that the ColorOS 6 update will soon be bringing a number of new features to the phone. One of our team members’ units has received the update, and you can see screenshots below. The Realme 2 update carries the build number RMX1805EX_11.A.25_0250_201903192122 and includes not only the March Android security patch, but also the Expert mode and fingerprint shooting for the camera app. The fingerprint shooting allows the users to tap the fingerprint sensor to click a picture when in the camera app. Lastly, the Realme C1 update’s build number is same as the Realme 2 update and the phone will be getting the same changes except the fingerprint shooting mode.